Railpictures.ca - Dave Burroughs Photo: The radiator shutters on top of the hoods are wide open on all three of these CN SW1200RS locos as they head toward Hamilton on the Oakville Sub. Note the two loaded general service gondolas at the head end of the train. HO kits of these interesting cars were made from die cast components by Ulrich Models. Unfortunately, Ulrich is no longer in business as of 2016. | Railpictures.ca – Canadian Railway Photography – photographie ferroviaire Canadienne. 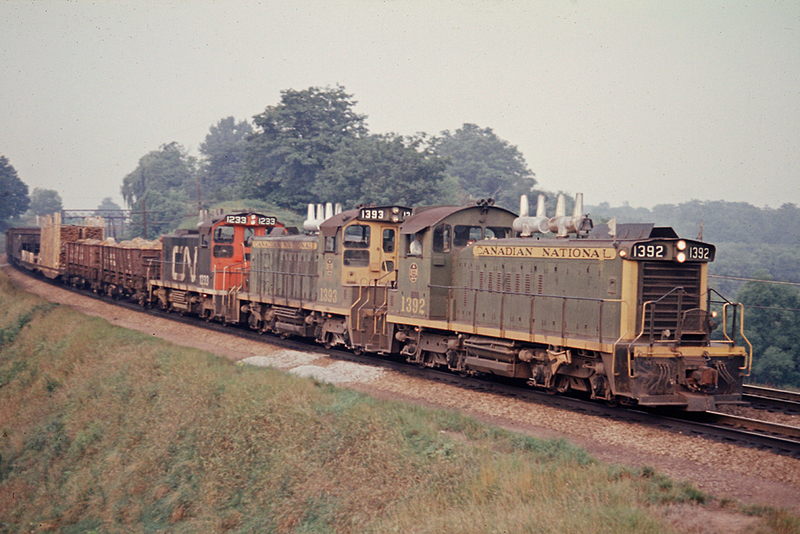 Caption: The radiator shutters on top of the hoods are wide open on all three of these CN SW1200RS locos as they head toward Hamilton on the Oakville Sub. Note the two loaded general service gondolas at the head end of the train. HO kits of these interesting cars were made from die cast components by Ulrich Models. Unfortunately, Ulrich is no longer in business as of 2016. Lovely old SW1200RS shot Dave..before my time. Nice to see a fellow modeller up here. I modelled my SW1200RS in 1985..trying to get er rolling again.